Whether it's the bodybuilder who picks up energy in the air, the rich girl who sees potential in the beer-drinking factory worker at her father's cardboard plant, the girl who turns against her evangelist father to find the real Jesus, the aunt with a withered arm who may have influenced Flannery O'Connor, the feminist scholar trying to reason with a good old boy, or the young MFA student determined to write a good story, this year's collection is about the connections these Southerners will to happen. Each story, as Ellen Douglas's thoughtful preface says, testifies to our need to "feel and understand the significance of the buzzing blooming dying chaos of our experience." This fifteenth edition is rich with unforgettable characters and full of great moments of comedy and tragedy. Each selection is accompanied by a look into the origin of the story. Readers will also find an updated list of magazines consulted by the editor for this edition and a complete list of all the stories selected each year since the series' genesis in 1986. Ellen Douglas is the pseudonym for Josephine Haxton, whose family roots extend back to the earliest settlements in Mississippi, Arkansas, and Louisiana. Her fiction has won many prizes, including the Houghton Mifflin Literary Fellowship, the Hillsdale Prize for Fiction from the Fellowship of Southern Writers, and the Mississippi Institute of Arts and Letters Award. She lives now in Jackson, Mississippi. 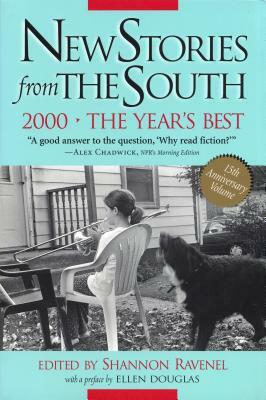 Shannon Ravenel has edited New Stories from the South since 1986. Formerly editorial director of Algonquin Books, she now directs her Algonquin imprint, Shannon Ravenel Books. She lives in Chapel Hill, North Carolina.